Do some cultural sightseeing at Point No Point Lighthouse & Park and Fort Nisqually Living History Museum. 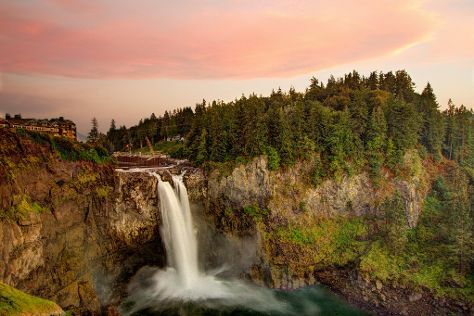 Step off the beaten path and head to Snoqualmie Falls and St. Paul's Church. Explore Seattle's surroundings by going to W.W. Seymour Botanical Conservatory (in Tacoma) and Tahoma National Cemetery (in Kent). There's much more to do: explore the world behind art at Chihuly Garden and Glass, stroll the grounds of Bruce Lee Grave Site, contemplate the waterfront views at Hiram M. Chittenden Locks, and get a taste of the local shopping with Pioneer Square. To find other places to visit, reviews, ratings, and more tourist information, go to the Seattle online tour builder . In April, plan for daily highs up to 61°F, and evening lows to 46°F. Wrap up your sightseeing on the 21st (Sun) to allow time to travel back home.